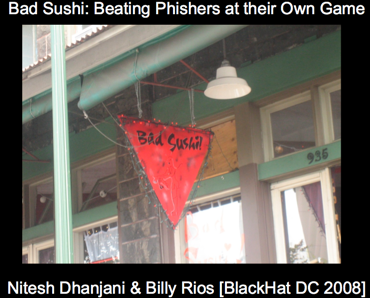 Help Net Security has posted an interview with me and Billy Rios titled Spies in the Phishing Underground. This talk will expose the tools and tactics used by the phishing underground. Follow us as we track real life phishers hiding in the shadiest corners of the Internet, analyze the tools used by phishers, and discover the sites where real life identities are being bought and sold. The specific topics covered by this talk will include: how phishers set up a phishing site, a look at the back-doors and phishing kits used by phishers, determining how phishers steal identities, and a detailed look at the forums used to buy and sell the stolen identities. We are excited about all our discoveries and we looking forward to the conference. We are also concerned about all the information we have discovered, and we are already sharing this information with the authorities. Also, Billy does a fantastic job of summing up our enthusiasm and concerns in his blog.